My name is Stefan, a guy lives in Europe. Probably as most visitors of this site me and my family also like fruit juice especially citrus juice. I bought one manual juicer press RUIDA FK5015 directly from manufacturer. I think that I found out the right product. The juicer is sturdy (over 6kg),effective, easy to operate and easy to clean and it beats all our previous similar appliances. Yes it is true! I bought many other juicers - electrical, manual, etc. Most of them were failures. The fact is that the juice extracted with a manual fruit press is with incomparable natural flavor unlike that extracted from electrical models. 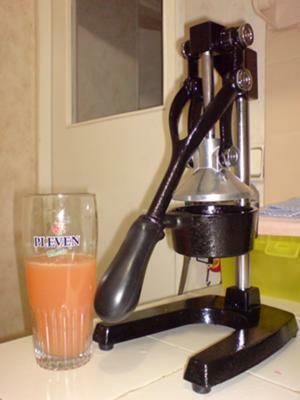 In this way I recommend to everyone to buy manual juicer press and you will feel the difference. As I said I bought juicer press directly from manufacturer. The company is very reliable,actually they delivered juicer only in few days after I had placed the order. Let me express my special thanks to Mr.Eden Lee, T H A N K Y O U ! From Vanessa: Thank you Stephan! For everyone intersted, this is a link to something very similar, especially those in the USA. Thank you for your comment. Yes, your suggestion looks really like my juicer, maybe only the fruit base of mine looks more massive and sturdy, but I am sure that it also will do the same great job as mine. Join in. Simply click here to return to Juicers .